The all-new 2018 BMW M5 comes packing the most power and features to date. Its revamped V8 makes 600 horsepower, and in a first for an M5, BMW's pinnacle performance sedan is all-wheel drive. That enables it to reclaim the acceleration crown from the Mercedes-AMG E 63 S with 0-60-mph blasts of 3.2 seconds, all while providing tremendous grip. Whether you're a longtime BMW M performance aficionado or simply want the most powerful model in the 5 Series lineup, the new M5 answers the call. It's certainly no surprise that this super sedan captured honors as the World Performance Car at the 2018 World Car Awards in New York. While its track skills are impressive, so are its everyday manners. This is a performance sedan that doesn't forget its luxury credentials. Brand loyalties aside, the new M5 is a pricey proposition at over $104,000. For about $30,000 less, you can get an M550i (reviewed separately). It's the top model in the standard BMW 5 Series lineup that also packs a V8 and brings prodigious performance and features. The 2018 BMW M5 sedan is all-new. Now in its sixth generation, it is BMW's fastest M performance car to date. In addition to boasting 600 horsepower, it debuts the German automaker's M xDrive system, which can be switched from all-wheel drive to rear-wheel drive. The 2018 M5's interior is, unsurprisingly, similar to that of the standard 5 Series. But like everything else M, it has been taken up a notch. For example, the transmission selector, one of the first things you'll touch, is nubbier than the pistol grip of the standard model, and in the M5 it's surrounded by additional buttons to tailor how the vehicle drives. As it's more of a toggle than a standard mechanism that moves up and down on a track, it can be a little awkward at first use. Also notable on the M5 are two red buttons peering from on top of the steering wheel like little ears. Labeled M1 and M2, they enable you to call up two customized driving setups tailored to your preference for everything from steering feel and dampers to the xDrive setup. As with its interior, the M5 retains the basic shape of its lesser 5 Series siblings, but has M-specific treatments for better performance. The M5's track and overall width are slightly wider than the standard 5 Series sedan, while its overall height is a hair higher. The roof is made of carbon-fiber-reinforced plastic to cut weight, and there's a unique front apron with enlarged air intakes and standard 19-inch wheels. If you're still not sure it's an M5, look in back. The biggest giveaways are the quad exhaust outlets. In a word, the new M5 is ferocious. We had the chance to test its mettle on Portugal's famed Estoril racetrack, a high-speed course that formerly hosted F1 races. Here we felt firsthand the benefits of the new M-finessed all-wheel-drive system. Directing the V8's 600 horsepower to all four wheels has a couple of benefits. First is acceleration. This new BMW M sedan can rip from 0-60 mph in 3.2 seconds because all four wheels are clawing at the tarmac. That same grip enables the new M5 to hang on in corners better than a 2-ton midsize sedan rightfully should. It just sticks. This is mostly the case in standard "4WD" mode. Switch to "4WD Sport," and the system allows the car to slide around more by decreasing its traction thresholds. Finally, there's the "2WD" mode, which sends all power to the rear wheels, like every past M5. It also disables traction controls, so you should know what you're doing. This allows expert drivers to drift the M5 like a gymkhana superstar. When not at the track this top-line 5 Series drives like, well, a top-line 5 Series. Whereas the past M5 felt rather beastly in the city and suburbs, this one is plush and serene when its driver-adjustable settings are tailored for comfort. High marks also go to the new 8-speed automatic transmission, which is more refined than the past 7-speed twin-clutch automatic. If the new M5 is missing anything over past models, it's a manual transmission. BMW says just not enough buyers were choosing it. The new BMW M5 has a Manufacturer's Suggested Retail Price (MSRP) starting just over $104,000 when including destination charge and a $1,000 gas-guzzler tax. 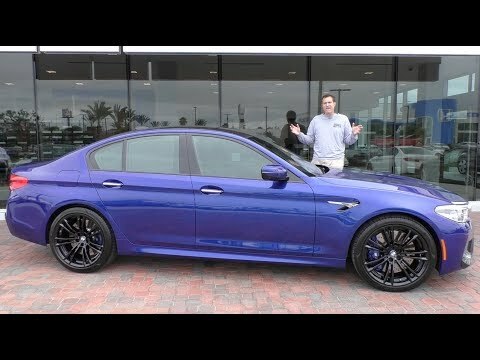 That puts it some $30,000 over the second-highest 5 Series, the M550i xDrive, itself a highly capable and competent performance sedan. At this price, the 2018 M5 is directly in line with its German rival, the Mercedes-AMG E 63 S sedan. Slightly below in price and above in horsepower is the Cadillac CTS-V, a 640-horsepower rear-wheel-drive performance sedan that starts around $88,000. Are there more powerful sedans for even less? Sure. A 707-horsepower Dodge Charger SRT Hellcat lists for under $70,000. But a big part of the BMW's price and appeal have to do with provenance as much as performance. Before ordering yours, check the KBB.com Fair Purchase Price to see what others in your area are paying. As this is an all-new version, we have yet to predict this new M5's resale value. As the top dog in the 2018 5 Series lineup, the M5 comes very well equipped out the gate. In addition to all its performance upgrades, you'll get 20-way-power front seats, extended Merino leather upholstery, head-up display, power-operated trunk, dual-zone automatic climate control, heated front seats and steering wheel, and universal garage remote. Safety features include blind-spot monitoring, lane-departure warning, and frontal-collision warning with automatic emergency braking. The standard infotainment system is a good one: It bundles a 10.2-inch, high-res screen with navigation and a harman/kardon audio system with AM/FM/HD Radio, CD player, USB input and Bluetooth streaming. The Driving Assist Plus package adds driving and safety aids like active cruise control, active lane-keeping assist and evasive aid. You can up the luxury factor on the M5 with the Executive Package that bundles amenities like power rear sunshade, soft-close automatic doors, wireless phone charging and in-car Wi-Fi, front seats with massaging and ventilation, surround-view camera and 4-zone climate control. Interestingly, you'll still have to pay extra for Apple CarPlay integration, but only $300. Android Auto is not currently available in the BMW. Other a la carte extras include that wonderful Bowers & Wilkins audio system, night-vision system, rear-seat entertainment system, moonroof and carbon-ceramic brakes. This optional audio system -- all 16 speakers and 1,400 watts of it -- is among the finest we've heard in a car. In fact, we wrote an entire Audio Road Test review of it from our last time in a 2018 BMW 5 Series. So you just bought the King Kong of luxury-performance sedans. Do you know how to drive it? Offered as a $2,500 option, this one-day class at a BMW Performance Center in California or South Carolina will teach crucial skills to get the most out of your new BMW M performance car. A revamped twin-turbo 4.4-liter V8 makes 600 horsepower in the new BMW M5. As mentioned, more than just power, what sets the latest M5 apart from all past versions is its use of all-wheel drive (AWD), but an M-specific system that can be switched to a rear-wheel-drive (RWD) mode at the driver's discretion. Even when the xDrive all-wheel-drive modes are implemented, the car is rear-biased as a performance car should be. Transmitting the power is a fantastic new 8-speed automatic transmission. Ironic as it may be, this high-performance sports sedan is in line with other new models that use an engine start/stop feature that cuts power at idle. We find the restarts can be abrupt, and thankfully the system can be deactivated with the press of a button. After taking a year off so the all-new 5 Series could establish itself, the 2018 BMW M5 crowns the lineup and proves there's still life for high-performance sedans. Now in its sixth generation, the 2018 M5 is all-new, and it comes packing the most power and features to date. Its revamped V8 makes 600 horsepower, but even more interesting is how that power is laid down. In a first for an M5, BMW's pinnacle performance sedan is all-wheel drive, which enables blistering 0-60-mph blasts of 3.2 seconds and grip that keeps this midsize missile glued to the ground. For experienced drivers seeking serious thrills, the M5 can be switched into a rear-drive-only mode so drifts and burnouts can ensue. Throw in luxury amenities galore, and the new M5 puts the Mercedes-AMG 63 S on notice. Review: 2018 BMW M5 - What Can&#39;t It Do? That i'm very passionate about my car. i love it like a part of the family. I love my vehicle. It's a sporty and It's a family type vehicle. I can fit my 3 kids and wife and go grocery shopping or I can go fast when I'm alone.